Pop punk veterans New Found Glory are happy to announce the release of their first book "Stories Of A Different Kind." The band has a limited amount of signed copies for pre-order in their web store newfoundglorystuff.com. The book will also be available all summer long on Vans Warped Tour. The band says in a joint said, "When New Found Glory first started, a messy photocopied piece of paper was the way in which we would tell people about our local shows. We could have never imagined that such a simple, lost concept would now serve as the spark to reignite a lost memory. 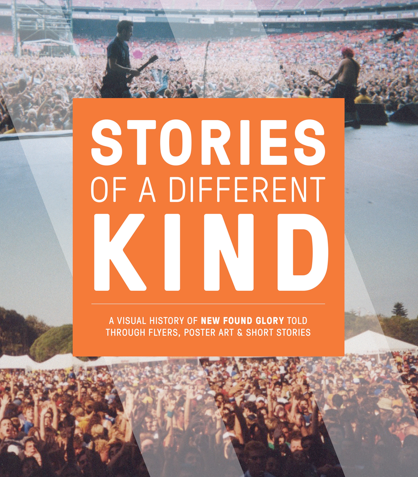 Stories Of A Different Kind is a storybook, but not a beginning-to-end narrative. It's a visual journey through a time period that pre-dates social media and blogs: a time that newer fans might not know had existed and older fans can look back on. This could be our biggest accomplishment as a band to date and we are very excited to share it with everyone. As fans, you're just as big of the reason why it exists as we are." Unlike a conventional band biography, these pages are filled with old flyers, artwork and photos from there past nineteen years together as well as short stories from Chad, Jordan, Cyrus and Ian. The book paints a colorful narrative from the first time they got paid at a show, to the first time they played Warped Tour to touring the world with Green Day and Blink 182. These anecdotes will make any fan reminisce about their own personal memories with the band and remember why they fell in love with them in the first place. "This was just as exciting to make, if not more than recording an album," guitarist Chad Gilbert said. "Our fans will love this and no matter where you open it or how many times you read it, you'll always find something new." New Found Glory will be appearing on the Journey's Left Foot Stage on Vans Warped Tour this summer. Fans can also sign up for Chad's music industry workshop on Warped Tour here thinktei.com/chadgilbert.